This is the linen apron that saved me. I’ve been wanting to make a simple apron for Andrew for a while now. I came across a leftover piece of linen in my stash on December 23rd and suddenly knew exactly how I was going to make it. For the tie, I found another scrap bit of fabric. That orange print always reminded me of a vintage kitchen textile. I made a very long piece of bias tape out of it, enough to wrap around the waist twice and tie. Then I cut the piece of linen to a large rectangle, using the selvedge as the top edge. To finish the other three edges, I folded a two inch hem, then folded it in again and made mitered corners. I love the look of mitered corners and when I have some time, I’m going to make some embroidered mitered corner cloth napkins. (hmm.. great holiday gift idea for next year!) To finish off, I just lay the orange bias tape across the top, folded the pretty selvedge edge down over it and sewed the top edge. It was simple and fast and the apron is so lovely. NOTE TO SELF: More holiday projects like this next year! Ohh beautiful! I have a love of linen that seems to know no bounds. This is perfect! I am just falling in love with you blog and work and material…. I did the same thing for my husband. Heavy linen seemed manly enough to fit the bill. Like you, I had it in my stash! 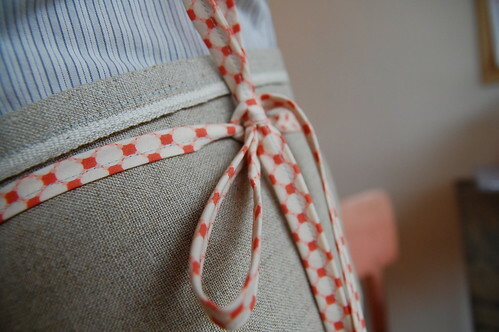 I love that apron…linen and little bursts of orange…It can’t get much better than that! Charlotte – Seriously, linen just looks good with everything! i only recently started appreciating it’s loveliness. Tiphaine – thank you for visiting! i just enjoyed a little tour of your sweet blog! Erin – yes, i struggled with what fabric & print to use and realized that it had to be linen. it has a lovely sparse japanese feel, with just a hint of orange. jessia – thanks so much! This blog gets better every time! Love all projects.